In the Old Testament men did great things in the name of The Lord (2 Chronicles 14:11-12). In the New Testament God gave us a name that is greater than all names; the name of Jesus (Philippians 2:9-11). His name has many meanings. A couple are savior and God is with us (Romans 10:12-13, Mathew 1:23). Jesus told us anything we ask in his name we shall have (John 16:23). 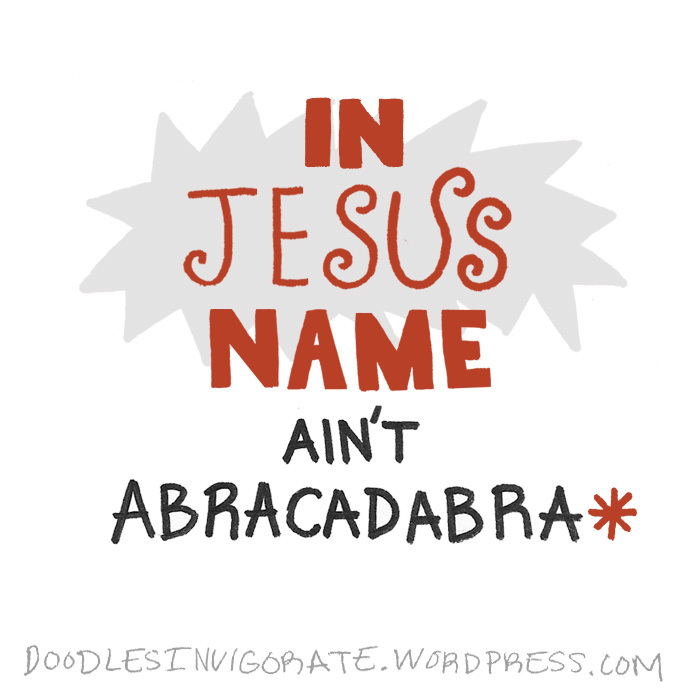 The problem is people equate the words ‘in Jesus name’ with ‘abracadabra’. They tag it on the end of a statement, hoping their wishes will come true. They say his name while doubting his power or without knowing his will. When we use those words in that manner we will witness a bunch of hocus-pocus. But when we use those words speaking in spirit and truth, the great and mighty power of God will manifest. He will move on your behalf. Know his name! In Jesus name ain’t abracadabra. LOL! I like that, 1800 dial-a-wish. I was thinking about adding a line about rubbing a bottle. 🙂 Yea, rubbing the Bible lol! Perfect! I love this! You put into words what I have been thinking. Love your sense of humor, love reading your posts – thank you!! Thanks so much! 😀 I’ve been thinking about it for a while also. I certainty have been guilty of miss using his name.